Coaldale Copperheads were on a mission this past weekend securing four for four points moving them into a tie for first of the south. Friday night on the road the Snakes got two quick goals thirty second apart to set the rest of the game tone against the Lomond Lakers. Jayden Smith and Ty Abbott each finished with three point night: each with a goal and two assists. Tyler Anderson, Brandyn Howg & Riese Nevil each with single to round off the 5-1 victory. Brock Merkl made 21 saves in net. Saturday night was just simply “fun in the Snake Pit” Special theme night “wear your favourite jersey” seen many mix-matched colourful sports team fans in the crowd. 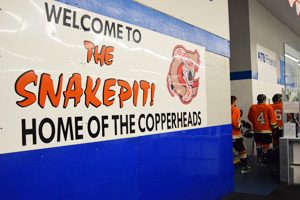 Copperheads were a force against the High River Flyers sending 78 shots their way. With a 6-0 win, Nolan Berner earned the shut out but to be truthful it was a solid team effort. This would mark goaltender Berner’s third shut out of the season. Single goals came from Smith, Howg, Jason Creighton & Jared Bainbridge. Two goals came from “defensive-forward “ type player Jayden Bexte. Earning these four points moves the Copperheads into a tie with the Okotoks Bisons both sitting at 15-3-2 for 32 points in 20 games a piece. Next weekend will be a three game weekend for the Snakes all against south division teams. Friday night at 8:30 in Claresholm (vs Lomond); Saturday Dec 1 at 8:30 at home vs Lomond; Sunday away game to a Strathmore at 2:00.